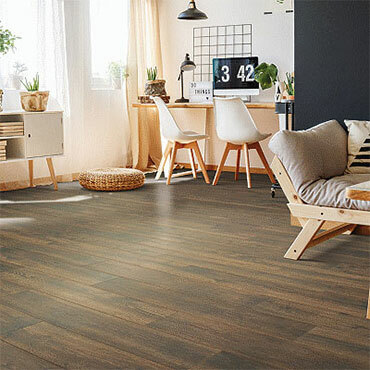 Mohawk Laminate Flooring has become a popular choice for many consumers owing to its knack to closely imitate today's most popular hard surfaces, especially hardwood planks and tiles. Besides the great textures and designs, Mohawk laminate flooring offers enhanced durability, easier maintenance and affordability compared to other types of hard surfaces flooring. Mohawk laminate flooring is extremely resistant to wear, stains and sunlight fading. The delightfully rich textured finishes makes this product a great alternative for most areas in the home. Mohawk Laminate Flooring offers a wide selection of rich colors and designs in several different grades, including laminates with pre-attached underlayments to help deaden sound and keep the floor warmer and "embossed-in-register" designs in which the surface texture exactly matches the image texture for highly realistic look and feel of real hardwood, tile and stones styles. You will find their product are as diverse as the personalities they reflect. Arriving in America from Europe over a decade ago, laminate flooring was inspired by countertop materials, only it's at least 20 times stronger. With a high-pressure surface it is practically impossible for spills and scuffs to leave a mark. The clear surface wear layer protects the design underneath and is highly resistant to cigarette burns and scratches from pets. Maintenance is quick and easy using a damp cloth or vacuum and most household cleaning chemicals will not harm this product. The surface is hygienic and is excellent for people suffering from allergies. Specially engineered with layered construction, this product can be installed almost anywhere in the home, including over dry concrete slabs, wooden subfloors and many types of existing floor coverings. The low clearance space height means this product is particularly suited for renovation and restoring old houses where floor thicknesses can be a problem. This product combines beautiful styling, textures and colors with the exclusive DuraLoc® installation systems. Choose from either the DuraLoc® glueless floors or the DuraLoc® Plus with the pre-glued grooves for superior plank locking. Beautiful Decorator Patterns - is designed to enhance the beauty, warmth and style of your home with a wide variety of beautiful styling, textures and colors to choose from. Installs Anywhere in the Home - can be installed almost anywhere in the home, including over dry concrete slabs, wooden subfloors, as well as many types of existing floors. Extremely Tough - the CrystalShield™ Finish is a rugged performer. Abrasion and indentation-resistant; high heels, cigarettes and household chemicals are no problem for the CrystalShield™ finish. Scratch & Scuff Resistant - is more resistant to scratching and scuffing that most other types of hard surfaces floors. Fade Resistant - decorator layer won't fade or change color from ultra violet sunlight. Moisture Resistant - Moisture block backing seals the bottom of each plank for additional stability and moisture resistance. Lasting Value - backed by a Lifetime Structural Warranty.